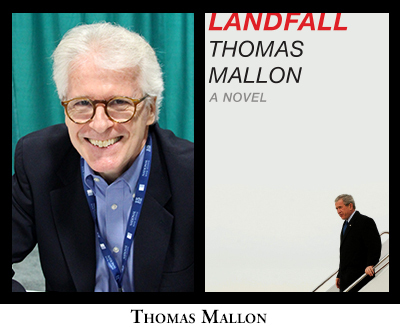 Please join us at Roosevelt House as we welcome Thomas Mallon, one of America's preeminent historical novelists, to mark the publication of his new book, Landfall: A Novel, set during the tumultuous midpoint of the George W. Bush years amid the twin catastrophes of the Iraq insurgency and Hurricane Katrina. Mallon will discuss how, as in his acclaimed books Watergate and Finale: A Novel of the Reagan Years, he mixes historical and fictional characters to bring the recent past to life. The president at the center of Landfall possesses a personality whose high-speed alternations between charm and petulance, resoluteness and self-pity, continually energize and mystify the panoply of characters around him. They include his acerbic mother, former First Lady Barbara Bush; his eager-to-please Secretary of State, Condoleezza Rice; the gnomic Secretary of Defense, Donald Rumsfeld; foreign leaders from Tony Blair to Vladimir Putin; and the imagined caustic one-woman chorus of Ann Richards, Bush's predecessor as governor of Texas. Kirkus Reviews praises Landfall: “Marvelously detailed, often darkly funny, as informative as it is entertaining. Mallon may well be the 21st century's Anthony Trollope."